22 people wounded in fireball explosion, including 11 children and 5 women. camera (Adel Hana/AP Photo) A ball of fire rises from an explosion on al-Zafer apartment tower following an Israeli air strike in Gaza City, in the northern Gaza Strip, Aug. 23, 2014. New video shows an upscale high-rise apartment building in Gaza City destroyed in a cloud of fire and smoke during an Israeli airstrike. 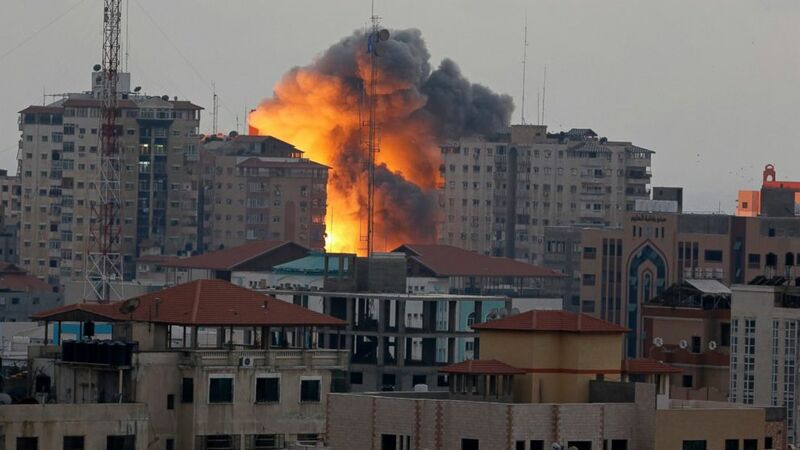 Israel bombed the 12-story apartment building, called the Zafer Tower in the Tel al-Hawa neighborhood, today as Hamas continued to fire rockets towards the Israeli border. The Palestine Interior Ministry released footage of the bombing, showing the apartment collapsing after being hit twice by Israeli bombs. The building goes down in seconds as onlookers scream and rush the injured to hospitals. The entire building held 44 residential apartments. "People started shouting Allahu Akbar, and women and kids were screaming," Maher Abu Sedo, an area resident, said. "This is crazy. The state of Israel has resorted to madness. In less than a minute, 44 families have become displaced. ... They lost everything, their house, their money, their memories and their security." Israeli had fired a warning missile five minutes before the attack, allowing some residents to escape the homes in time. But 22 people were wounded, including 11 children and five women, according to Gaza hospital officials. Israeli military officials said the two missiles were targeting a Hamas operations room in the building, but did not explain why all 44 apartments were destroyed. The attack comes just as Egypt renewed its appeal for mediation between Israel and Hamas. It appears unlikely that truce talks will resume. Previous talks have ended in failure and an agreement between Israel and Hamas that would end the blockade surrounding Gaza has stalled. Since the fighting erupted on July 8, Israel has launched some 5,000 airstrikes at Gaza, while Gaza militants have fired close to 4,000 rockets and mortars, according to the Israeli military. More than 2,100 Palestinians, including close to 500 children, have been killed, according to Palestinian health officials and U.N. figures. Israel has lost 64 soldiers and four civilians. Israel says it is targeting sites linked to militants, including rocket launchers, command centers and weapons depots. The U.N. says about three-fourths of the Palestinians killed in the airstrikes and fighting have been civilians.